Irritable bowel syndrome is a chronic digestive condition that can cause mild to severe gastrointestinal symptoms. Some people have a greater sensitivity to certain foods, such as dairy that can trigger symptoms. If drinking protein shakes causes your IBS symptoms to develop, stop drinking the shakes until you can be seen by your doctor. Most protein shakes are made with milk and milk proteins, such as whey protein, which can cause digestive complications if you have IBS. Irritable bowel syndrome is a disorder that affects about 20 percent of the American population, according to the National Digestive Diseases Information Clearinghouse. Most cases of IBS are found in women before the age of 35. IBS can cause chronic diarrhea, constipation, bloating, abdominal pain, diarrhea and cramping. While the condition causes distress in your digestive system, it does not harm to your intestines and does not cause the development of any other diseases. The condition is primarily treated with stress reduction, dietary modification and medications. Not everyone with IBS has difficulty digesting milk but if drinking protein shakes causes your symptoms to develop, the dairy in the protein shake may be the trigger. Protein shakes are made from milk and whey protein, a dairy protein. 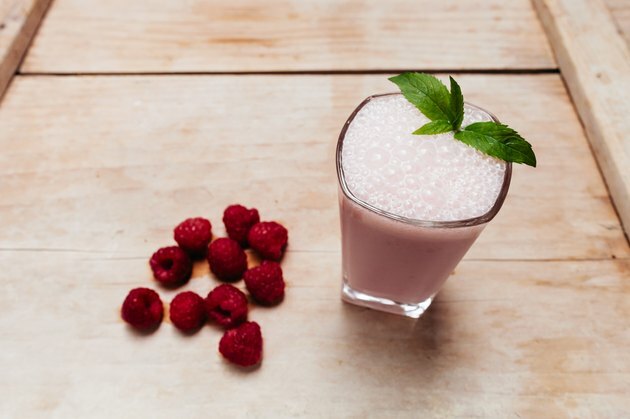 A challenge diet can help determine whether the protein shake is increasing your IBS symptoms. Remove all dairy products from your diet for two weeks. When the two-week elimination period ends, drink the protein shake. Write down the symptoms that develop from ingesting the shake and discuss them with your doctor. Lactose intolerance is commonly mistaken for IBS and is common if you have IBS. Lactose is the sugar found in milk that can cause digestive difficulty for some people. Drinking a protein shake that is made with milk contains lactose and can cause similar symptoms to IBS. Lactose intolerance is the inability to digest lactose because of an enzyme deficiency. Common symptoms that will develop from ingesting lactose include gas, bloating, diarrhea, abdominal pain and cramping, according to Pub Med Health. If your doctor determines that milk or the proteins used in the protein shake are triggering your IBS symptoms, choose alternative protein shakes that do not contain milk. Dairy-free protein shakes may include shakes that are made from soy, hemp or brown rice. These alternatives can provide the same amount of protein without the complications from milk-based protein shakes. Can Someone With Irritable Bowel Take Whey Protein Powder? Does Whey Protein Contain Lactose?